During the 1910s, conflict and failure demarcated the relationship between the Shoshone-Bannock of Fort Hall and the federal government. To protest the government’s discriminatory policies and lack of economic opportunity, the successful Indian Stockmen’s Association was founded in 1920. From the creation of the Fort Hall Indian Reservation until the 1934 Indian Reorganization Act, the reservation was controlled by the federal Bureau of Indian Affairs (BIA). Without clearly understanding the cultural and physical needs of the Shoshone-Bannock, the BIA and on-site agents often made decisions that conflicted with local values and harmed the general welfare. For example, horses symbolized power, mobility, and strength to the Shoshone-Bannocks, who required at least ten steers as payment for just one horse. To the government, the horses were just obstacles in the way of progress. The final straw was in September 1920, when government agents quietly rounded up 1,200 horses and sold them for less than $6 apiece—to be turned into chicken feed. Meanwhile, individual ranchers were successfully circumventing the reservation bureaucracy by communally sharing allotment lands for cattle grazing. In 1917, Thomas LeSieur, a Cherokee married to a Shoshone woman, sold his cattle for $8.45 a head, the highest price for range beef cattle in Idaho that year. Others on the reservation had also realized the economic potential cattle provided, especially Ralph Dixey and Pat Tyhee, both Shoshones. Dixey stated in 1917, “This is a cattle country; my people here are stock raisers.” Land-use policies under previous Indian agents gave preference to non-Native ranchers with the pretext that their herds were more profitable. Outraged by discriminatory policies, the loss of their horses, and the general poverty of the reservation, Dixey and Tyhee joined with other Shoshone-Bannock ranchers to form the Fort Hall Indian Stockmen’s Association (ISA) in 1921. The organization’s objectives were to protect the reservation range land, to raise better cattle and horses, to make the herds self-sustaining, to build a sales yard at Fort Hall, and to foment cooperation with white neighbors. By the end of 1921, the ISA had about 5,000 head of cattle on the reservation. Local newspapers and ranchers were amazed by the quality of the herds. The ISA became so successful that the herdsmen built stock yards and feeders to expand the scope of their operation. Buyers came from as far away as Los Angeles to look at the cattle, but the ISA was insistent that the cattle first be sold locally. Partially, this goal would help offset costs, but it was also a useful tool to build bridges between Shoshone-Bannock ranchers and their non-Native neighbors. The cattle operation turned out to be a popular and very profitable experiment for many decades afterward and was subsequently copied by several other Native American groups in the west. The Indian Cattlemen’s Association continued to be a powerful player in tribal economics and politics throughout the twentieth century, but today the ISA has been superseded by Shoshone-Bannock Tribal Enterprises. 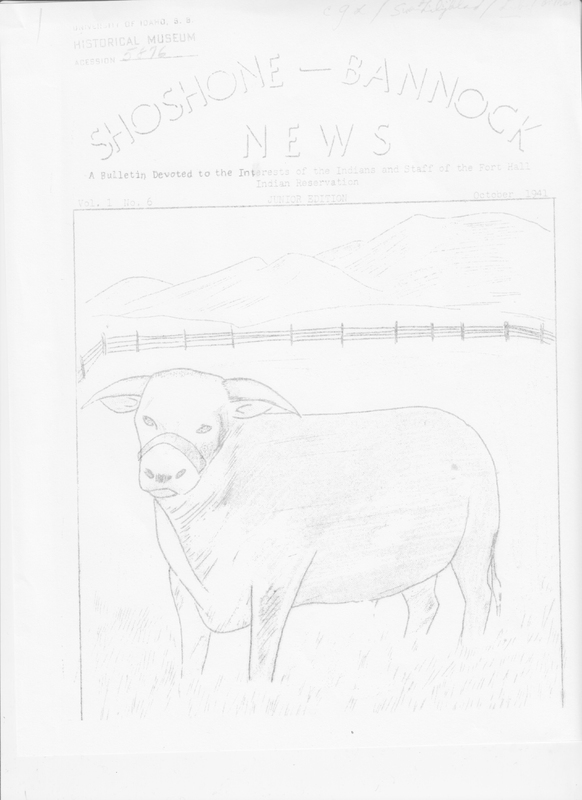 Untitled: Newspapers from across the Intermountain West advertised Fort Hall cattle sales. 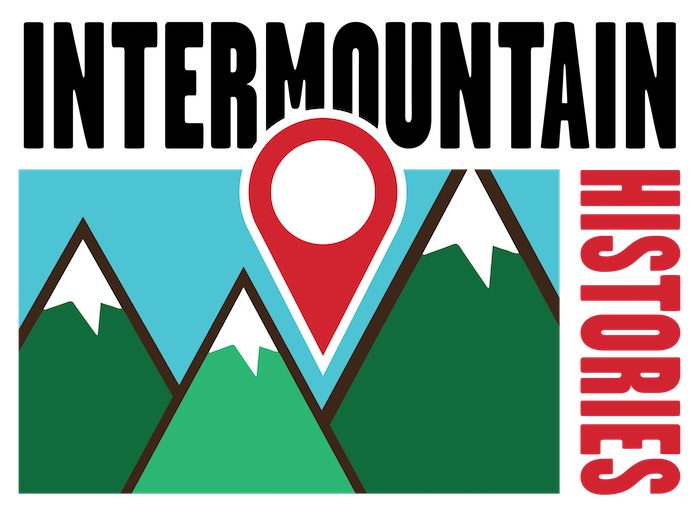 ,” Intermountain Histories, accessed April 19, 2019, https://www.intermountainhistories.org/items/show/205. The Daily Herald. “Uintah Basin Meet Closes,” 25 August 1938. 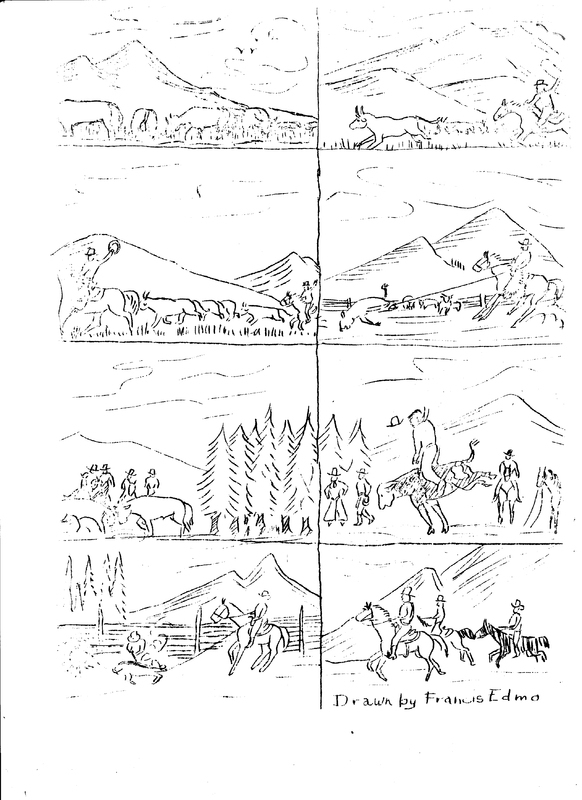 Heaton, John W. “‘Bad Medicine’: The Shoshone-Bannock Rejection of the First Fort Hall Reservation Boarding School, 1800-1900,” Idaho Yesterdays (Spring/Summer, 2010). Heaton, John W. The Shoshone-Bannocks: Culture & Commerce at Fort Hall, 1870-1940. Lawrence, KA: University of Kansas Press, 2009. The Idaho Recorder. “Idaho State News,” 3 December, 1914. The Idaho Republican.“Big Cattle Round-Up Starts June 27, Indian Cattle Men’s [sic] Association to Build Coralls,” 22 June, 1922. Trego, Byrd, The Idaho Republican. 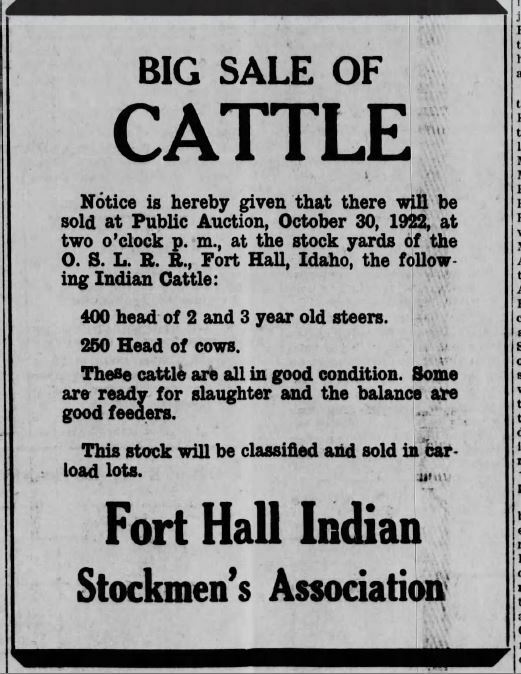 “Indian Range Cattle Bring Big Price Here,” 14 October, 1917. The Idaho Republican. “Indian Stockmen Discuss Means of Bettering Herds,” 5 December, 1921. See also Heaton, 171-173. Salt Lake Telegram. “Annual Meets Slated by Two Cattle Groups,” 8 February, 1935. Available at https://newspapers.lib.utah.edu/details?id=16363575. From Shoshone-Bannock Tribal Enterprises. “Native American Business, Strengthening Local Community,” available at http://www2.sbtribes.com/.